A very fast short sword. Features a blade that swells slightly at the top to put more weight in the hand to improve its cut and thrust capability. Steel furniture with wood grip covered in leather. Can be seen in E.Oakeshott’s book ‘Record of the Medieval Sword. 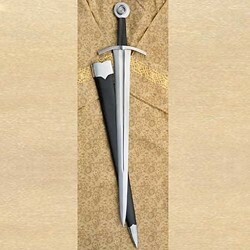 Includes leather scabbard with matching steel parts. 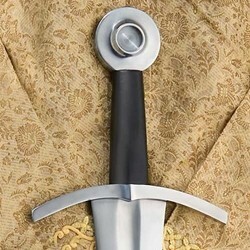 Effective and historically important sword.